In the 15-year history of International Talent Support, the talents hailing from Japan have continually captured the attention of the jurors. And the reasons can be easily traced in the unique beauty of their portfolios that illustrate a strong relationship between materials, colors and shapes. Statistically speaking, Japan’s contribution to the ITS Seismography proves this observation. For the past 15 years, out of the 550 total finalists from 80 countries, 55 are Japanese. With over 700 enrolled designers. An even more interesting fact on the Japanese winners: as many as 20 out of 158. 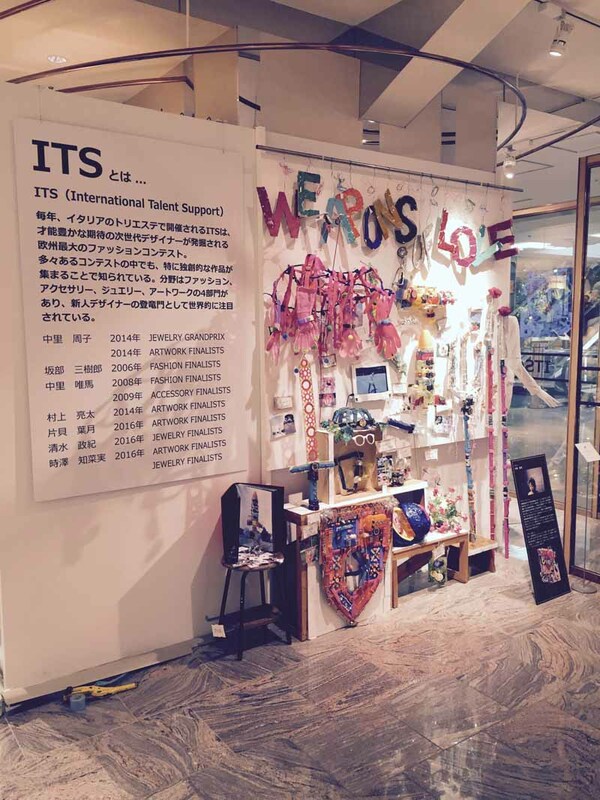 The special exhibition at the Isetan Store in Shinjuku, Tokyo, features the work of the seven finalists of the past editions of ITS. Apparel, accessories, works of art and jewelry pieces can be viewed by public. One of the creatives involved is Ryota Murakami who dedicated to ITS founder and creator Barbara Franchin a t-shirt that features her portrait. Mikio Sakabe – Selected pieces & Outfit from ITS#FIVE award-winning collection “Reversible Manga Tailoring”. Yuima Nakazato – Selected accessories & ITS#EIGHT award-winning flat circular zipper boots. Noriko Nakazato – “Fontana di Trevi” installation piece inspired by her ITS 2014 Jewelry style. Ryota Murakami – Selected knitwear pieces & Barbara Franchin 2016 artwork printed t-shirt. Hazuki Katagai – “Weapons of Love” Artwork project presented at ITS 2016. Masaki Shimizu – “Egg Paradise” jewelry collection present at ITS 2016. Chinami Tokizawa – “Sticky Jewelry” collection presented at ITS 2016.